Melted goat cheese is the best! I’ve been ill recently and to amuse myself while I lie on the sofa, I’ve been scrolling through random Instagram feeds from across the world. Today I came across someone who lives in the French Alps, and I saw a picture of a quiche that she had made. I thought…oooh, that would make great lunches for the week! You can make this quiche too! I’ve put down the amounts of the vegetables that I used, but you can easily substitute in whatever veggies you have on hand. You could even use frozen vegetables that you’ve cooked and drained, and of course you can use whatever cheese you have on hand (just grate it or cube it). Let’s get to making some quiche! A great dish to use up bits of veggies and whatever you have in your fridge! Slice the onions and saute on low medium heat for 15 minutes or until mostly golden and translucent. Add the baby tomatoes after you've pricked them with a fork (this helps the juices escape and caramelize) as well as the carrots. Saute all together until the carrots can be easily pierced with a fork, and the tomatoes are more wizened than plump. Mix the eggs, milk, and cream together. Stir in the arugula. Place the crust in a pie pan. Sprinkle the goat cheese in crumbles on the pie crust. Cover with the sautéed vegetables. Pour the egg mixture over everything, and baked in a 400 degree oven for 15-20 minutes or until the crust is golden brown and the egg mixture is golden and top and fully set when pierced with a fork. This is the best pie crust to use: my vodka pie crust! Buttery and flaky and just plain yummy! Serve with a side salad and enjoy! I’ve packed most of this for lunches for the coming week, but of course it’s just as yummy when served as dinner! Next Post: Copycat Peach Yoplait, I think. High in calcium and yummy peach flavour! This entry was posted in Vegetarian Main Dishes on April 15, 2018 by Margaret. I love making this or that quiche, although I’ve never added goat cheese. I usually put goat cheese on pizza or salads or sandwiches. I really, really love making quiche to have for breakfast. It’s such a nice change from my usual breakfast of high fiber cereal and skim milk! 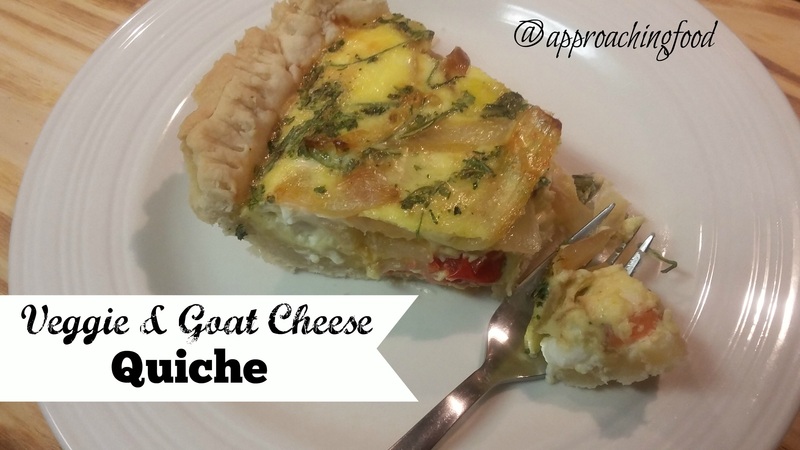 Goat cheese is surprisingly delish in a quiche! Adds a lovely sharp flavour! I agree with Jennifer above and have never used goat cheese on a quiche. Hubby always wants Colby jack on EVERYTHING! I did try this recipe but used leftover broccoli, more cream, and no butter. That was what was in the refrigerator. It worked fine. It is an easy recipe and one I will use again.